Hawk Feathers can be found on dead hawks along with hawk beaks. 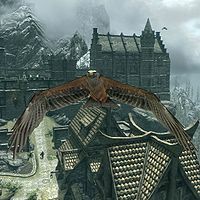 They have Cure Disease as their first effect, and Cure Disease is an effect that is not magnitude-dependent—so eating hawk feathers provides the same benefits as any Cure Disease potion. They are a lightweight and cheap alternative to the potion, which is probably why Silver Hand members frequently carry them. 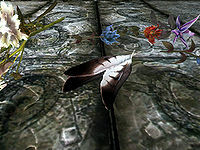 75% chance at 1-3 hawk feathers at 9% each, or 9% chance at 1 hawk feather being carried by any Silver Hand members. The base magnitude of the Cure Disease effect for this ingredient is 2 instead of 5. The only real implication of this reduced magnitude is that if charred skeever hide and hawk feathers are combined, the resulting potion will cost 64% less than a typical custom Cure Disease potion. This page was last modified on 9 April 2018, at 04:50.